Useful Information > All About Our Community > Who Are We? 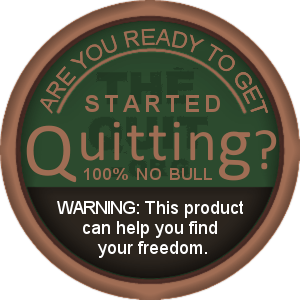 TheQuit.org was founded by a group of quitters dedicated to helping others quit chewing and dipping tobacco. At one point we were all dippers. If you are still using tobacco, every single one of us was where you are now. Then we made the decision and kept our promise to quit dipping. We know what its like to be a slave to a can, and we know how hard it is to quit. We know what it takes to quit, and stay quit. This process has made such a huge impact on all of our lives that some of us stick around to help others find the same freedom that we have. Because that’s exactly what quitting is, finding freedom. Don’t let common misconceptions fool you. We are not a bunch or hicks or rednecks, well, not all of us. We are normal people from all around the country. We are like your coworkers, friends and acquaintances. We are business men, blue collar guys, students and everything in between. We have a few very basic and effective principles that we live by, and we are all living proof that they work. The foundation that this place rests on is accountability. As crazy as it may sound to someone looking in from the outside, the way that we quit is by holding each other accountable. We maintain this accountability but doing what we call ‘signing-in’. When we ‘sign-in’ with our quit groups, we are giving our word to every member of our community and ourselves, that we will not use nicotine today. This is how we hold each other accountable, our word is everything. If you think your finally ready to quit, come check out or message boards. That’s where most of the magic happens, and where the actions is. You can find all of the information on how and where to ‘sign-in’ there. All are welcome to quit with us, membership and registration are completely free, and you can keep your identity to yourself. VIDEOS: Can you handle the truth? We Quit. It's That Simple. We have the tools and support you need to quit dipping and finally free yourself. Dean on How Long Does Nicotine Withdrawal Last? TheQuit.org is an online community and resource dedicated to helping people quit spit tobacco. This site is 100% free, and all are welcome to join and quit with us.